January 22 and 23, 2016 brought a massive winter storm to the Washington DC region, dropping several feet of snow on the area. In a very rare occurrence, I got two days off of work for snow, which was enough time to let the snow fall and then dig back out from it. I was at work when the snow started, and got home before things got really bad. After the snow stopped, I undertook the rather monumental task of digging out the Soul. I not only had to clear a path in front, but I also had to clear some space on both sides in order to get in and out and maneuver around. And then, three days after it started, I was back at work. Back home from work and ready to be snowed in. Note the amount of snow on the cars on either side of me compared to the Soul. Slowly getting snowed in. Unlike in 2014, I didn’t bother to keep on top of this one, since I knew that no matter what I did, it would be massive, plus the snow was still very deep going from the door to the car. On January 24, the storm was over, and thus began the task of getting out. Before even dealing with the car, I had to clear a three-foot pile of snow that projected eight feet out in front of the car. Some of that snow was compressed by plowing efforts, which made it more challenging to break up. Slowly chipping away at the snow in front of the Soul. I didn’t really have any place to put the snow once I moved it, so my strategy was to just scatter it and hope that it would melt quickly now that it was spread more thinly. Two milestones in the snow removal: finding the “reserved” marking in my parking space, and finding the hood of the car. Clearing the snow from the front of the car, but still firmly stuck in place, as the wheels aren’t free yet. Powered up in order to get warmed up to help defrost the windows and such. Still not free quite yet. And the next day, back in the parking garage at work, still with a little bit of snow in places, but nothing to be worried about. On February 25, I decided to be something of a rebel. Front-in parking only, you say? Don’t tell me what to do. On March 16, the Soul is shining again after some routine maintenance. On May 20, the Soul hauled away the mattress from the old futon, which had finally reached end of life after fifteen years of service. I replaced the futon with a real couch. We took the mattress to the Shady Grove Transfer Station and tossed it over the wall into the big dumpsters. On July 14, 2016, the Soul made her first visit to York, Pennsylvania. Here, she is parked on the side of Whiteford Road while I went to go photograph a water tower. On August 12, Elyse commandeered my phone for a selfie while we were driving around a few neighborhoods looking at ugly houses. On October 3, Elyse and I went up to Philadelphia to pick up some very unique fire alarms. Here, Elyse is sitting on the back of the car with one of the horns that we got. When Elyse and I went to Pittsburgh on October 25, I captured a photo of the Soul, parked on the street, from 36 stories up. Elyse helps Royal Street the dolphin hold her camera at the end of our planespotting outing on November 15. Whenever Elyse and I would go to the Washington Auto Show, we would always stop at the Kia display to see what the newest Souls looked like. I didn’t hesitate to say a few kind words about my 2012 model, either. The 2017 show, which we attended on January 31, going with our friend Dave, was no exception. Elyse and Dave pose with the Kia hamsters. Elyse pretends to drive one of the new Souls, while Dave rides in the back seat. On April 4, 2017, after a visit to the then-new Dave and Buster’s in Silver Spring, I spotted a Soul nearly identical to mine. The other Soul had a slightly different spoiler, different wheels, and extra lights, but otherwise looked the same. So I got a few photos in the parking lot. From May 30 to June 1, 2017, Elyse and I took a weekend trip down to the Outer Banks, staying in Buxton like I did with my friend Pete in 2014. The trip followed a similar profile as in 2014, where we stayed in Buxton, rode the ferry to Ocracoke, explored Ocracoke, etc. We also explored the northern Outer Banks during this trip, going as far north as the Currituck Beach Lighthouse in Corolla. The Soul rides the MV Roanoke, a Hatteras-class ferryboat, to Ocracoke. This time, I made sure to keep the windows closed, in order to keep the salt spray out. Less that I have to clean that way. I figure, I know that I’m going to mess the exterior up on a trip to the Outer Banks, but if I can keep the inside clean, all the better. Waiting in line for the ferry to depart Ocracoke Island at the end of the day. On our final day at the Outer Banks, Elyse smiles for a photo before I went out to photograph the Cape Hatteras Lighthouse. She didn’t want to get out, but did ask that I point the Soul towards the lighthouse so that she could look at it. At the New Kent rest area off of Interstate 64 westbound. On July 19, parked at Shepherd University in Shepherdstown, West Virginia while Elyse, Aaron Stone, and I explored the campus. On August 9, the Soul turned her 81,818th mile while I was pulling into IKEA. On August 23, after a visit to the Silverball Museum in Asbury Park and the Rainforest Cafe in Edison, Elyse and I took the Soul on her only trip into New York City. We came in through the Holland Tunnel, quickly crossed Manhattan and went over the Manhattan Bridge into Brooklyn, drove through DUMBO, and eventually made our way to Grand Army Plaza, where we stopped for a little bit. When we resumed, we drove through a few neighborhoods, and over the Verrazano-Narrows Bridge to Staten Island, and then over the Goethals Bridge to return to New Jersey. That was a fun, unplanned adventure. Waiting at a light on what is technically Interstate 78 before entering the Holland Tunnel. Elyse is ready to film the Holland Tunnel from the Soul. Parked along Grand Army Plaza in Brooklyn while Elyse and I explored. By November 15, I had bought a house in Montgomery Village, and was moving my electronics and picture frames ahead of the big move. As you can see, it all fit nicely into the back of the Soul. November 16 was moving day. The movers parked their truck right next to the Soul, still in her reserved space. They never asked me to move the car, because I otherwise would have. They just parked their truck next to it. On November 28, 2017, the Soul’s engine died while I was driving to work. The cause of death was a seized rod. She needed a new engine, but the good news was that the new engine was covered under the 100,000-mile powertrain warranty. The only thing that I paid for was various other maintenance work that I had done while she was already in there, such as new wipers and four brand new tires. With her new engine in place, she was practically a brand new car, running better than she had in quite some time. Turning the key and hearing her purr like a kitten, I quickly fell in love with her all over again. On December 1, the Soul is out of the shop following her rehabilitation, all shined up and ready for more adventures. On December 9, I had my first snowfall since moving to Montgomery Village. The Soul was in her new parking space in front of the house, getting her first covering of snow in Montgomery Village. On December 31, I made a final visit to my old apartment in order to do a walkthrough to make sure that everything was as I wanted to leave it, and then turn in the keys. I got a final photo of the Soul in my reserved parking space, in front of the leasing office, and then leaving for the final time. On Jaunary 25, 2018, the Soul made what would turn out to be her first and only road trip with the new engine. We visited Harpers Ferry, Charles Town, Martinsburg, and Hagerstown on this adventure. Elyse brought her stuffed flamingo, named Larry, with us on this trip. Larry posed for a couple of photos on the Soul’s steering wheel after we got home from our trip. I took this photo on January 30 as I was leaving for work. We had been predicted to have some snowfall the night before, and, much to my delight, the snow ended up being a bust. I posted it to Instagram at the time, making a sarcastic comment about the lack of snow. As it happened, this would be my last photo of her fully intact. And then on February 7, 2018, the unthinkable happened. After an outing with friends that took us from Gaithersburg to Rockville to Silver Spring to DC to Alexandria to Annandale and eventually out to Dulles Airport, Elyse and I were traveling north on Route 15 on a route that would take us back home via Point of Rocks. However, as we were approaching Lucketts, the car began acting strangely. Elyse and I both initially thought that it was a transmission problem, and then we saw flames. I quickly stopped the car, and we evacuated. The Soul burns to death on the night of February 7. The Lucketts Volunteer Fire Company has arrived, and is putting out the fire. The fire is brought under control. When the tow truck arrived, Elyse and I surveyed the damage. I was speechless, seeing my pride and joy in that state after it had been in good order not long before that. When she was loaded onto the flatbed, I knew that it was time to say goodbye. This was the last time that we would ever see each other. My very last photo of the Soul was this one, showing her on the tow truck while a firefighter shovels debris from the fire, including the front bumper and radiator, off of the road. The next day, I had rented a car, and got all of the materials together to send to the insurance company. I had to send the title and the keys to Progressive along with some paperwork so that they could process the insurance claim. Sending them the title really hit home, because it meant that the car that I had driven for nearly six years was no longer mine. It now belonged to the insurance company. A week later, on February 15, I had the Honda, and Elyse and I had gone out with my friend Matthew for dinner up in Frederick. To bring him back to his home in Reston would take us past the site of the fire. Elyse had planned for this, and intended to look and see if there was anything that she could salvage for a souvenir. As we approached the site of the fire, we spotted a white object on the side of the road: the Soul’s radiator. So we pulled over, and Elyse started looking to see what we could find. Elyse found the fire-damaged front bumper on the side of the road, with the license plate still attached and green paint still visible. The Kia emblem from the hood was stuck to the back. 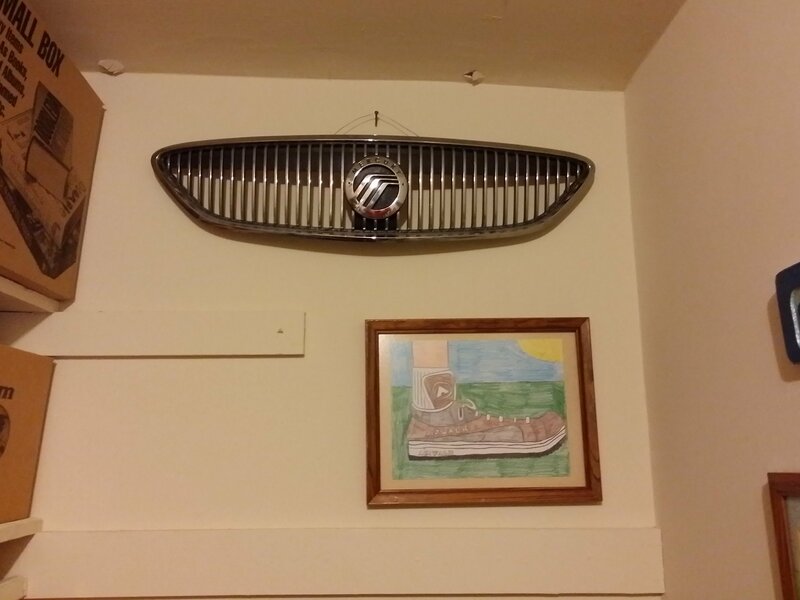 She plans to clean it up and display it as a wallhanging, much like what I did with the Sable’s old grille. And that is the life of a Kia Soul in photos. I would be lying if I said that I didn’t still miss her a little bit. I had intended on keeping the Soul until it was time to retire her, and I did, though that time came a lot sooner than I might have predicted. Finding her auction photos online, however, did give me a sense of closure and allowed me to move on. And now, with the Soul gone, I’m making new memories with the Honda.